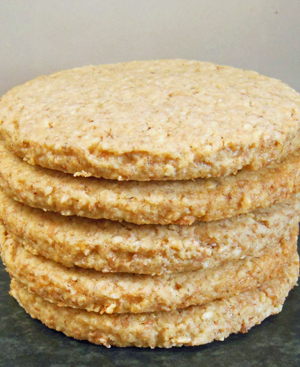 To finish my 5 days of digestive recipes here’s a recipe to make your own. These are the real deal and seriously delicious. 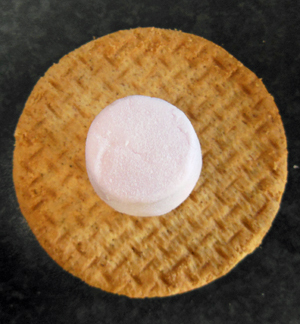 They have similarities to factory made ones but can’t really be compared – I wouldn’t dream of putting a melted marshmallow on top of one of these. I’m thinking of making these wholesome treats to give to trick or treaters on Halloween. Is that cruel? 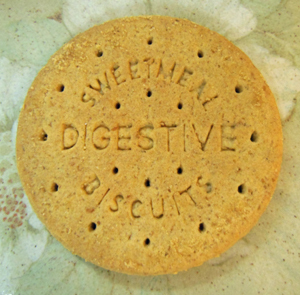 NOTE: Whilst delicious, in my experience these digestives don’t keep awfully well. 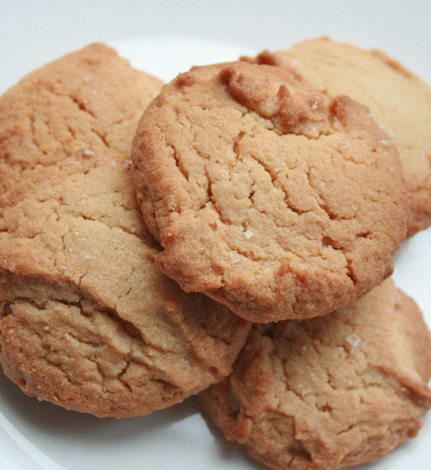 They are best eaten on the day of baking but after a day in the tin they start to go soft. For this reason I halve or even quarter the recipe below. Makes 35-40 (to make this amount you will need two square baking trays and you will need to cook them in two batches, unless you have two ovens). 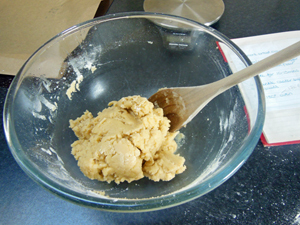 Measure the butter, flour, oatmeal, sugar, salt and baking powder into a large mixing bowl. Mix the ingredients together with the tips of your fingers until the mixture resembles fine breadcrumbs. Now add a little milk, a few drops at a time (you may not need to whole amount) until everything comes together into a slightly sticky dough. 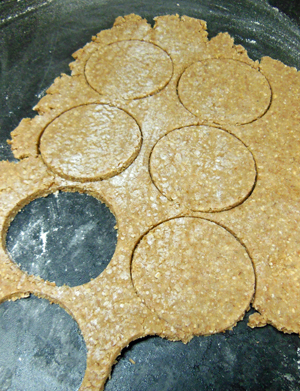 Dust with flour and press into a disc about 25 cm in diameter. Wrap in cling film and leave to rest in the fridge for at least 30 minutes to firm up a bit. If you are making the dough in advance then you will need to take it out of the fridge for about an hour before you need to roll out as the dough will become very hard. The dough will keep for up to a couple of days in the fridge. When you are ready to cook preheat the oven to 170oC fan. Dust the dough, your work surface and rolling pin liberally with flour and roll out carefully dusting with more flour to stop the dough sticking until it is about 3-4 mm thick. Cut out the biscuits with a 6-7 cm cutter and use a spatula or palette knife to transfer them to baking sheets (either non-stick or lined with greaseproof paper). Place in the oven and bake for up to 10 minutes checking regularly that they are not browning too much around the edges. You want an even light brown colour on the top and a slightly darker brown around the edges. Remove from the oven and leave on the baking sheets to firm up before transferring (using a palette knife of spatula) to wire racks to cool completely. Eat with a nice cup of tea. I challenge you to only eat one, they are very moreish. On the tray ready for the oven. As with Marmite people seem to love or hate banoffe pie. I adore it, but it’s my husband’s absolute worst nightmare. For this reason (and because it is so calorific) I only ever make it when we have a really big gathering with lots of other desserts. As we haven’t had people over for a while this is why there’s no picture to show you of one I’ve made recently. At parties it’s always the first to go leaving me disappointed that there are no left overs to enjoy as a hung-over breakfast the morning after. Because you can now buy the condensed milk ready caramelised there’s really not much to this dessert. Gone are the days of boiling the tins in water for several hours on the hob. When I was a student I had a terrible accident making banoffee pie – the pan boiled dry and I ended up with exploded caramel covering the whole kitchen. By the time I’d finished scrubbing molten sugar off the walls, ceiling and floor the kitchen had never looked so clean and our slum landlord was delighted. This is a useful recipe to have to hand but I do feel like a bit of a fraud because it’s virtually identical to the one on the side of the Carnation condensed milk tin. 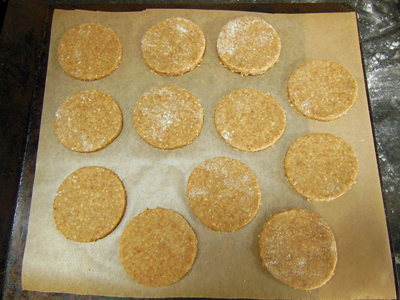 For the biscuit base melt the butter in a saucepan and then add the crushed digestives. 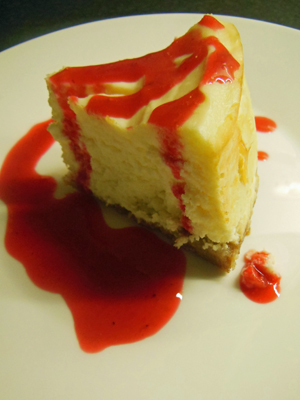 Stir to combine and then tip into a loose bottomed flan tin with a diameter of 23 cm. 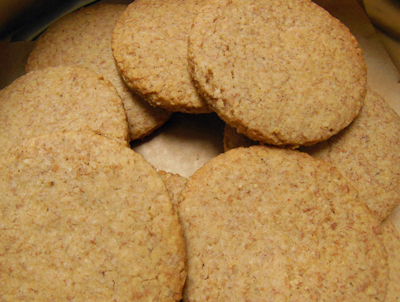 Press the biscuit mixture across the the bottom of the tin and up the sides. This is a bit fiddly and it is quite tricky to get it even. I find using my fingers or the back of a spoon quite helpful. Leave to chill in the fridge. 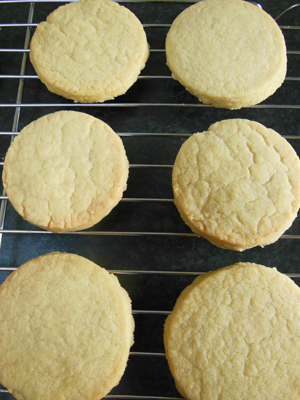 Slice the banana thinly (about 2mm) and arrange it neatly over the biscuit base. Pour the tin of caramel over the banana and spread evenly using a palette knife. Do not be tempted to beat the caramel to make it easier to spread and this will change the consistency completely and make it too runny. Chill in the fridge. When you are ready to serve whip the cream and spread over the top. Decorate with grated chocolate. 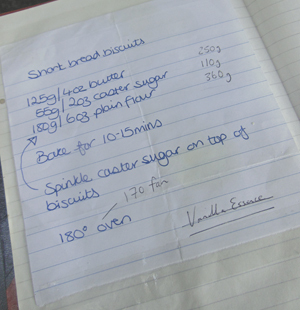 I love shortbread but couldn’t make it to save my life until I was passed this super simple recipe by my friend Melanie. These are the easiest biscuits to make as they only involve three ingredients, butter, sugar and flour. They make great impromptu gifts. I buy see-through presentation bags from Lakeland and then tie with a nice piece of ribbon. At Christmas you can use Christmassy cutters – bells, Christmas trees and simple fairies work well (nothing too intricate). Simple rounds with half the biscuit dipped in melted plain chocolate and then set in the fridge also look good. 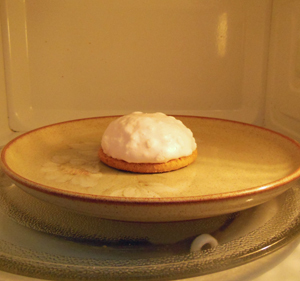 Preheat the oven to 170oC fan. Melt the butter in the microwave or in a saucepan on the hob. 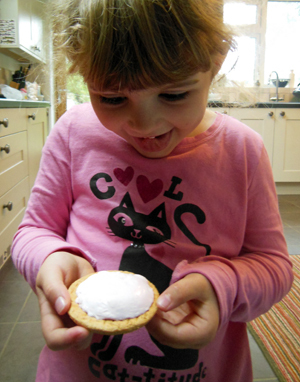 Add the flour and caster sugar and mix to combine with a wooden spoon until the mixture forms a ball. 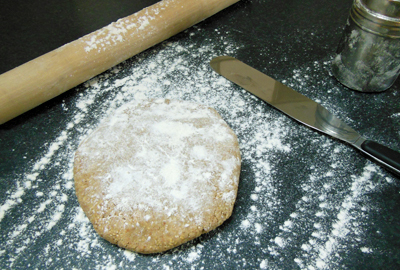 Tip the dough onto a well-floured work surface. Flour a rolling pin and roll the dough out until it is half a cm thick. 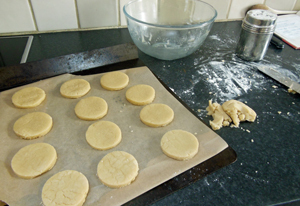 Then cut out the biscuits with a 6cm round cutter and lift carefully from the work surface onto a baking tray with a pallet knife. Collect up the remaining dough and form into another ball and repeat the process, rolling and cutting until all the dough is used up. Bake the biscuits for 10-15 minutes. You want them to be a light golden colour and not dark around the edges so I check frequently after the 10 minute mark. Remove the biscuits from the tray with a pallet knife onto a cooling rack and don’t store them away in a tin until they are completely cool. When I said ‘super easy’ I may have exaggerated just a little bit. The slightly tricky part of this recipe is that the dough is very sticky so you will need to work quite quickly and use plenty of flour on the work surface and rolling pin. 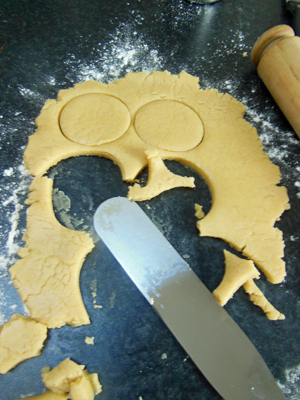 If the biscuits do stick don’t panic, just scrunch the dough up into another ball and start again. Unlike pastry this shouldn’t ruin the result. 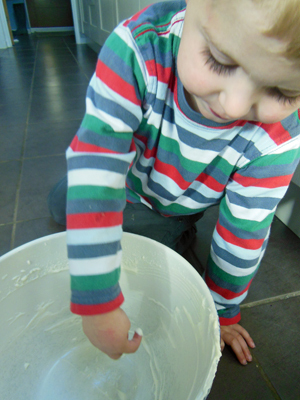 Mixing the butter, sugar and flour to form a dough ball. Cutting out and transferring to a baking tray with a pallet knife. The end result cooling on a rack. (A little messy – I’d make more effort to be neat if these were for a present rather than to be eaten all up by my family in less than a day).